The nice thing about a WYSIWYG editor is that your site users don’t have to understand HTML in order to produce richly formatted content. This makes WYSIWYG editors great for content management systems, blogging systems, webmail applications, or any situation where you want people to be able to enter rich content via a Web form. One problem with WYSIWYG HTML editors is that they tend to churn out poor-quality, bloated HTML, although recent editors have improved their HTML output considerably. Another problem is that users of a content management system with a WYSIWYG editor can easily break the style conventions of a site by adding their own non-standard formatting (see Inline HTML editors ruin your brand). For example, the site’s style guide might stipulate that all headings should be green, but the user decides to create a red heading in the WYSIWYG editor. It’s hard to prevent this kind of problem using WYSIWYG HTML editors (although you can lock them down to a certain extent). For a different way to enter and format content, see Textile and Markdown: 2 Nice Alternatives to WYSIWYG Editors. where fieldname is the name or ID of your textarea field. This should be placed after your textarea field in the markup. Alternatively, you can place it in the head element, or as an onload event handler on the body element. Make sure your server-side script encodes HTML entities in the content inside the <textarea> / </textarea> tags. For example, < should be encoded as &lt; and > should be encoded as &gt;. You can place this code anywhere in your page body, or in the head element. I have successfully added ckeditor to my Question Answers script at: http://www.aboutcivil.com/answers , Thanks to your nice tutorial. The WYSIWIG editor now shows up instead of the text field but is not accepting the data. Like when i press submit button, it says “Your answer cannot be empty” , means its not taking the input and wont process it. Can u please help me on this issue?? 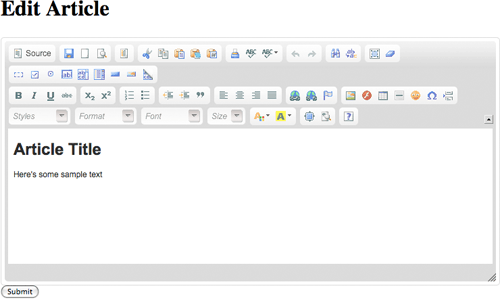 @haseebjamal: I can’t see the WYSIWYG field in your page. Where’s your call to CKEDITOR.replace()? After you have registered, please click on any question, when the answer button shows up below the question, click it and then the ckeditor shows up, working fine but the form is not submitting. Excellent tutorial and dead easy to follow, I have very basic knowledge and managed to add tinymce in minutes – great work!! Thanks! First of all thanks for your tut on CMS. 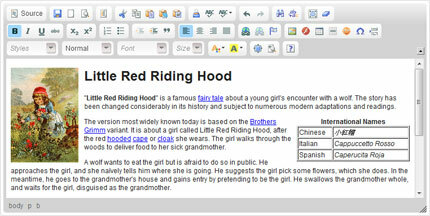 I am trying to add ckeditor into textarea field of edit article page of CMS (downloaded by your site). But no changes is showing there. Tell what is the problem. I know i am missing out something but dont know actually. Just search the page for “ckeditor”. Thanks for your reply but I’ve no problem with CKeditor now. I solved it already. Thanks again for your tutorials. Can you make a tutorial for how to make a complete basic site by drupal. I have searched many contents regarding it but not satisfied with that. @vny009: Glad to hear it. Never used Drupal but I might have a go at some point – could be a fun project! Can i print this article. kindly send me printable link if possible. This little piece of code I placed at the top doesn’t allow my form’s content to be submitted to the database. When I removed it, the form’s content was submitted, how do I sort this out? Thanks a lot. @papadammy: You’ll need to post the URL of your form so we can take a look. Hi-Thanks for this nice tutorial (from wayback when-December 2009!). I am looking at tinymce editor at the moment. It’s a snippet of code from the CKEditor example that you’ve shown above. As you can see, the ID or Name of the textbox is “content” and if my understanding is correct, this is the ID or Name that needs to go into the CKEDITOR.replace call. In this case, “articleContent” is written there when it should be “content”? I’m kind of confused about this. Please help. Thank you. Change the class names and IDs of the CSS styles, so they are unique to the editor.